That was a time before the throb of diesel engines and the squawk of the rangers’ radios could be heard from afar. Back in the day, when the pace of life was slower and weekend camping was a regular outing, tents were often musty, smelly and cramped. Those of us who belonged to some sort of youth organisation could attest to coming home smelling of canvas after spending time communing with nature, all the while running around pretending to be pioneers. How the ghosts of those early trailblazers must have laughed. But tents have changed and currently the “word du jour” is glamping. The closest these tents come to those early incarnations is the fact that they have canvas walls. And there any resemblance to the bend-down-and-crawl-in type of accommodation ends. Not a single guy rope or tent peg to trip over. I found this to be true when visiting the Safari Plains Tented camp. Yes, the walls of my luxury accommodation were canvas, but the doorway (not a canvas flap) was of regular height and I could actually enter while in an upright position. No long-drop toilets or bucket showers here. The ablution part of the “tent” was a brick structure that housed not only a shower and a toilet, but a bathroom, dressing area and not one but two hand basins! Electricity and running water. What would those early, brave tent dwellers think of us city folk out for a weekend bush experience? It was the actual canvas enclosed part that I wanted to share with you. Not a canvas chair or fold up camp bed inside. And I certainly did not require a sleeping bag. A huge bed surrounded by swathes of mosquito nettings was the most prominent feature in the space. It was hard to ignore, given the plethora of pillows adorning the head of the bed, while a coloured throw covered to foot. Two leather footstools at the end of the bed can be used to sit on instead of an old wagon chest that might have graced one of the old tents. There is a fridge, well stocked with both alcoholic and non-alcoholic beverages, and unlike back in the day when water had to be collected from a nearby river, there is bottled as well as fresh tap water available. Off to one side of the tent is an intimate seating area, with a small table and two comfortable armchairs. It was here, by electric light (not fire) that I sat and wrote about my daily experiences. Did I mention that the floor was concrete with rugs to keep guests’ feet warm in winter? Perhaps I forgot as I was too busy remembering the times that I slept on uneven, rock-strewn ground. Outside on the verandah were two canvas and wood chairs. Perhaps as a homage to those early travellers who might have set up their camp in the area before the advent of all these modern amenities. 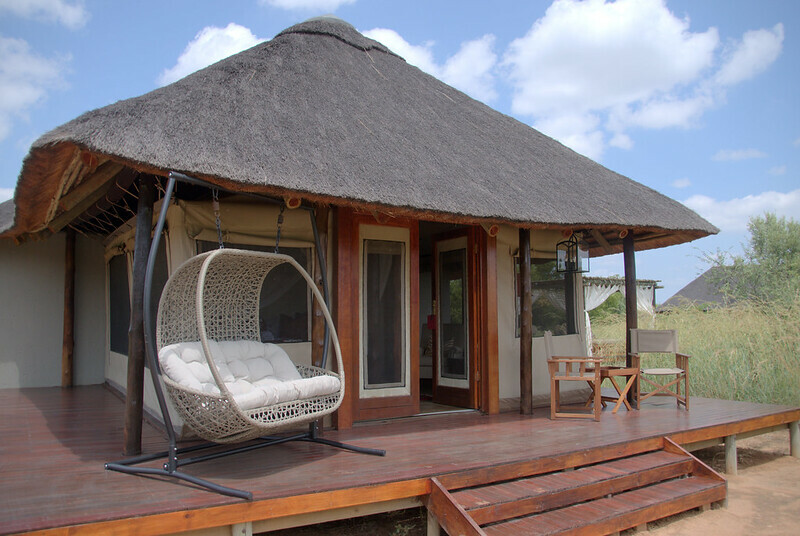 These luxury tents look out over open plains in winter and fields of tall grass in summer. It is an ideal spot to pour myself a G&T from the fridge and to share stories about the bush with a loved one. But then, as if to bring us back to the present, a metal rocker with overstuffed pillows sits opposite, offering modern comfort. 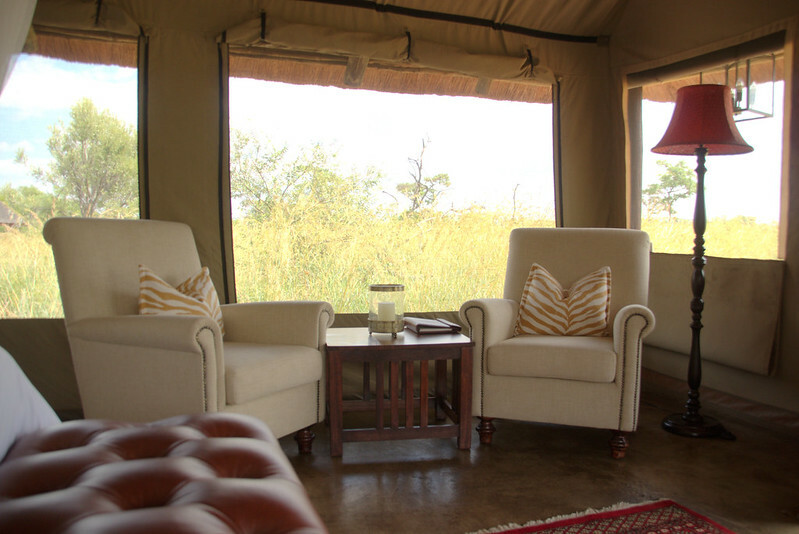 But my canvas abode was just that – a place to relax between game drives and meals. I suppose that is one thing that I do have in common with the early pioneers is my love of the bush. And who knows perhaps some of the plains animals currently roaming in the surrounding game reserve might well be distant relatives of those that became food on earlier expeditions. Of course, comfort and style are what the modern guests want but what they seem to hanker for is an original bush experience. 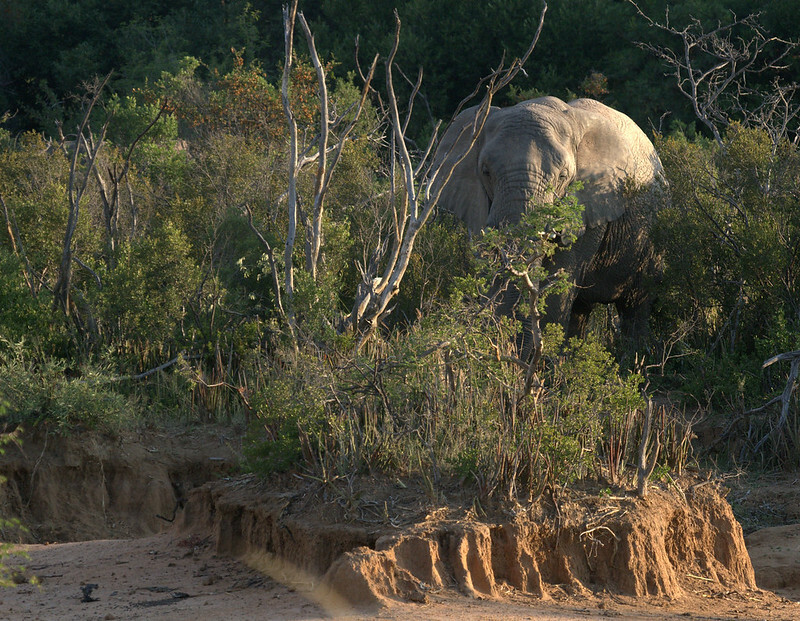 And thanks to early hunters the big five are always front of mind. 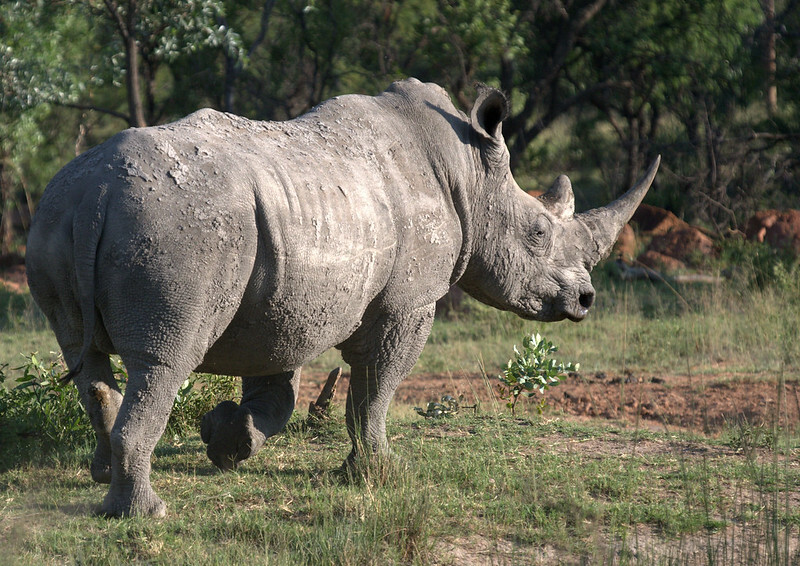 Many visitors to South African game reserves do not know that these animals were given this name as they were considered to be the most dangerous to hunt on foot. But times have changed and the only shots being taken from vehicles now are of the digital kind. Lion, leopard, buffalo, rhino and elephant make up the quintet. Personally, I believe that hippo should have been included; obviously, it was not hunted enough. Sitting quietly on the back of a game drive vehicle while one of these five walks close by and perhaps stopping to make eye contact is a memory that lasts for a lifetime. The one thing that we can still share with our ancestors is the vast African sky. Sunsets and sunrises that were spectacular then are similar today and ending off a drive with a freshly made G&T is certainly a way to celebrate both their fortitude and our experiences. 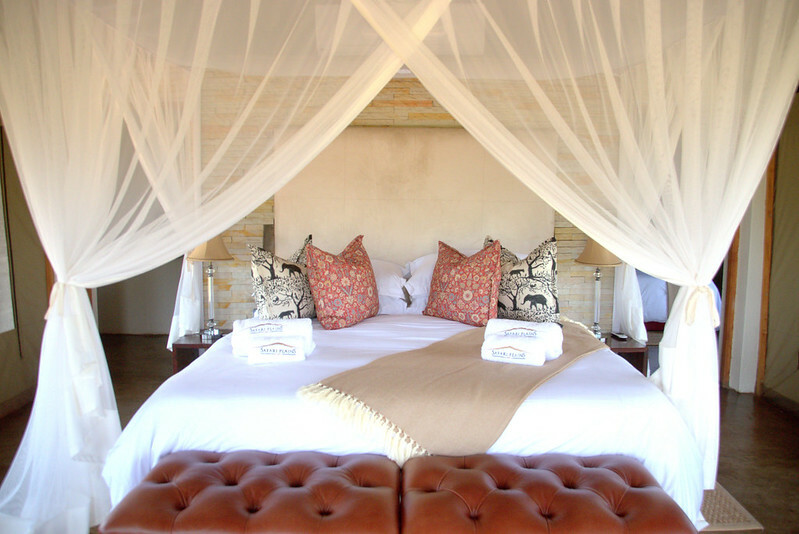 The lodge is situated before you get to the turnoff to the main Mabula Game reserve, an easy three-hour drive from Johannesburg. (Google maps still has not rectified its directions. If you are going to follow them, then use Bela Bela as your destination.) Once there you can enter Safari Plains to get you to the correct gate. You can phone ahead if you have dietary requirements. There is a small shop on the premises that stocks clothing and curios. Make sure that you have enough memory cards for your camera and don’t forget your phone charger! Binoculars, sunscreen and a torch should also be packed.